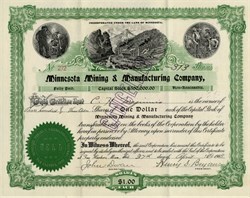 Beautiful certificate from the Minnesota Mining & Manufacturing Company issued in 1904. This historic document has an ornate border around it with a vignette of various mining scenes and a millsite processing facility with a train. This item has hand signatures of two of the original founders, the Company’s President (Henry S. Bryan) and Secretary (John Dwan). The certificate is over 114 years old. At the time the certificate was issued, the company's offices were located in Two Harbors, Minnesota. Starting out on the North Shore of Lake Superior at Two Harbors, Minnesota in 1902, the company moved to Duluth, Minnesota, and finally moved to its current headquarters in Maplewood (a St. Paul suburb) in 1910. Like many new businesses, 3M struggled for years before it could settle itself in the market. Twelve years after being founded, 3M was able to develop its first exclusive product; 3M Three-M-ite cloth. Other innovations around this time by 3M included the waterproof sandpaper and the masking tape. After this point, the famous Scotch brand tape was “born.” By 1929 3M made its first moves in to an international expansion by forming “Durex” in order to conduct business in Europe. This same year, the company’s stocks were first traded over the counter and in 1946 the stocks were listed on the New York Stock Exchange (NYSE). The company was founded by Henry S. Bryan, John Dwan and three others who incorporated 3M on the North Shore of Lake Superior at Two Harbors, Minnesota in 1902. Their original plan was to sell the valuable mineral corundum to manufacturers in the East, who wanted corundum for the grinding wheels they used to finish their products. After selling only one load, on 13 June 1902 the five men walked into the Two Harbors office of company secretary John Dwan—now part of the 3M Museum. They signed the papers making Minnesota Mining and Manufacturing a corporation. But Dwan and his associates were not selling what they thought they were selling: the mineral was anorthosite, and it was worthless. After failing to make sandpaper with the anorthosite, they decided to import minerals like Spanish garnet, and sandpaper sales grew strong. Then in 1914, customers started to complain that the garnet was falling off the paper. They found that as the stones had travelled across the rough Atlantic Ocean with olive oil, the oil had penetrated the stones. Unable to take the loss of selling expensive inventory, the company found that the olive oil would come out if the garnet was washed and then dried. The company's early misadventures taught 3M employees that "ingenuity and perseverance can overcome even potentially ruinous mistakes." In 1916, company general manager William L. McKnight applied the same measured scientific methods to production that he had used to save the company from bankruptcy and bought the company's first lab for $500. From then on, science would be 3M's guide. The company's early innovations include waterproof sandpaper (early 1920s) and masking tape (1925), as well as cellophane "Scotch Tape" and sound deadening materials for metal-frame cars in the years that followed. 3M's corporate image is built on its innovative and unique products; up to 25% of sales is devoted to newly introduced products. In the late 1960s and early 70s, 3M published a line of board games, largely under the "Bookshelf Games" brand. These games were marketed to adults and sold through department stores, with easily learned simple rules but complex gameplay and depth and with uniformly high quality components. As such, they are the ancestors of the German "Eurogames". The games covered a variety of topics, from business and sports simulations to word and abstract strategy games. They produced their games in several formats: the "bookshelf" line, a smaller line of mostly card games known as the "gamette" line, and a sports game line which consisted of a vinyl playing board which wrapped around the box holding the game components. These included classic games such as chess, backgammon, and Oh-Wah-Ree, as well as original designs such as Acquire, Twixt, and Feudal. They were a major publisher at the time for influential American designers Sid Sackson and Alex Randolph. In the mid-1970s, the game line was taken over by Avalon Hill. During the 1970s, 3M introduced its first and only traffic signal, the M-131. Labeled a "programmable visibility" signal, the signal had the unique ability to be "programmed" so it could only be seen from certain angles. It was the first signal of its type and is still being produced today. 3M was able to sell these signals for special-use applications; usually left turn signals, skewed intersections, or dangerous intersections where a very bright indication is needed. The signals are very heavy however and expensive to maintain. Removal is quite frequent in some areas of the country. 3M was involved in some of the first digital audio recordings of the late 1970s to see commercial release when a prototype machine was brought to the Sound 80 studios in neighboring Minneapolis. In 1980, the company introduced Post-it notes. In 1996, the company's data storage and imaging divisions were spun off as Imation Corporation; Imation has since sold its imaging and photographic film businesses to concentrate on storage. Today, 3M is one of the 30 companies included in the Dow Jones Industrial Average (added on August 9, 1976), and is ranked number 101 on the 2006 Fortune 500 listing. The company has 132 plants and over 67,000 employees around the world, with sales offices in more than 200 countries. The vast majority of the company's employees are local nationals—that is, very few employees reside outside their home country. Its worldwide sales amount to over $20 billion, with its international sales reaching 58% of that total. On 20 December 2005, 3M announced a major partnership with Roush Racing, one of NASCAR's premier organizations. In 2006, the company will sponsor Todd Kluever in the NASCAR Busch Series as he drives the #06 Ford Fusion. 3M will also be an associate sponsor of Mark Martin's #6 Ford in the Nextel Cup Series. In addition, on 19 February 2006, 3M announced that it would become the title sponsor of the 3M Performance 400 at Michigan International Speedway for at least the next three years. On 4 April 2006, 3M announced the will to sell pharmaceutical non-core business. The pharmaceuticals businesses were sold off in three deals, in Europe, North America and the Rest of the World. Another division of the Health Care business, Drug Delivery Systems remains under the control of 3M. The Drug Delivery System division contract manufactures inhalants and transdermal drug delivery systems.